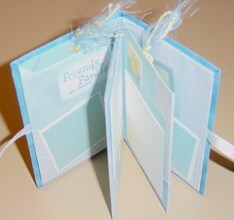 If you are looking for a meaningful gift for a loved one this Christmas, consider making a mini album. They are easy to construct, fun to decorate and show the receiver just how much they mean to you. 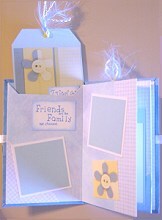 To create a mini album, you need cardstock, patterned papers, stickers or embellishments, eyelets, fibres, ribbon and a pen. This particular one was made using blue cardstock as a base, white cardstock, scraps of blue patterned papers, Pebbles Inc Funky Flowers stickers, yellow eyelets, blue fibre, yellow fibre, white ribbon and a blue pen. 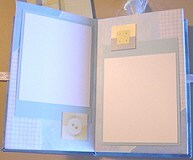 Begin with an 8 1/2 by 11" piece of blue cardstock. Fold it in half lengthwise and unfold. When folding, make sure you are very careful to line of the edges and corners accurately. Next, fold your cardstock height-wise and leave it folded. Again, be very careful to line of the edges and corners accurately. Fold one edge back to meet the centre fold. Turn over and repeat for the other side. Open everything up. Your rectangle should now be divided into eighths by your folds. You now have three vertical lines. Using a craft knife and a metal ruler, cut along the middle line from the first vertical line to the third vertical line. Fold your cardstock lengthwise. Hold the ends and gently push towards the centre to form a cross. Now fold the pages over to form a book. Temporarily set your newly made book aside and cut two pieces of cardstock slightly larger than the pages of your book. Cover each one with patterned paper. These will form the covers to your book, but do not attach them yet. It is now time to decorate the pages of your book. Before you begin, consider if you would like to hide tags within the pages. This can be a fun way to include some extra messages or hidden goodies. It's also a great way to surprise your friends and family when they open up your book. If you would like to include hidden tags in your book, you will need to determine which pages you would like to feature them on. When you have decided, cut a hole in the top of the page. This will enable you to slide the item in and out easily. 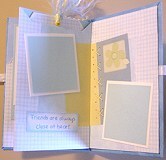 Use your patterned papers and stickers to decorate your album. Remember that the front and back pages will be glued to your covers so you do not need to decorate these. While you're at it, also make and decorate your tags. The pictures below show how this album was decorated. Once you are happy with your design, it is time to attach your front and back covers. Before you do so, lay one cover in front of you with the front face down. Attach a piece of ribbon horizontally half way up the right side. Only about 1cm of the ribbon needs to be attached. The rest should hang out the side. This is the ribbon you will use to tie your book closed so make sure it is long enough. Repeat this step for the other cover, only this time, place it on the left side. Now that your ribbon has been attached, glue the covers to the front and back pages of your book. Make sure you use a strong adhesive - you don't want it to fall apart later. I used double-sided Scotch tape for this part. I recommend letting it sit for awhile just to make sure the adhesive sticks properly. Finally, add an embellishment to your front cover. 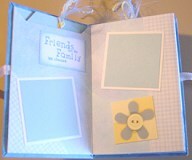 I used a sticker from Pebbles Inc Funky Flowers stickers matted on green Bazzil cardstock, but the choice is up to you. These albums are great when you are looking for a meaningful gift. Use your imagination to adapt them to any theme you are like. 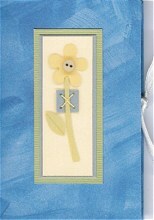 You are sure to create some treasured keepsakes with these!